Years and years ago, I saw an episode of the Two Fat Ladies where they made a fish pie. I thought it looked absolutely DELISH, but I just never got around to making one. So when I decided to do a series of British foods to celebrate the London Olympics, I knew the fish pie had to be included. I didn't even realize how hugely popular it is. It's basically British comfort food at its best! And I'm told that the best way to serve it is with bread and butter so you can sop up all the yummy sauce. SO good! If you like a rich creamy seafood sauce, you'll like this! Try it! Pour the fish stock, milk, and wine into a large saucepan and bring to a gentle simmer. Add the fish pieces and bay leaf and poach for 5 minutes. Remove the fish pieces with a slotted spoon and keep to one side. Reserve the liqueur. Melt the butter in a medium sized saucepan over a medium heat. Add the sliced leeks and cook for 5 minutes until the leeks are soft. Add the flour and stir well with a wooden spoon. Pour the fish liqueur into the pan and stir again, raise the temperature and cook for 3 minutes until the sauce is slightly thickened. Turn the heat off. Remove the bay leaf. Add the fish, chopped parsley and season with salt and pepper. Leave to one side. 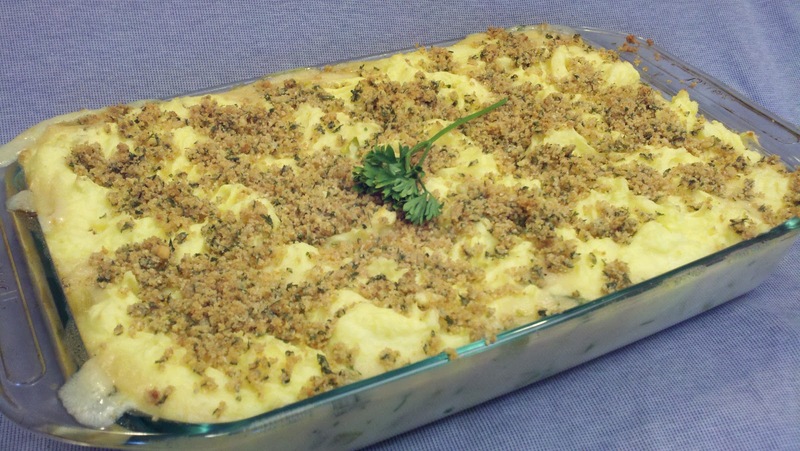 Place the fish and sauce into an ovenproof dish, cover with a thick layer of mashed potatoes. Put the dish onto a baking sheet and cook for 20 minutes. Sprinkle with bread crumbs or grated cheese and bake for another 10 minutes or until bubbly. Serve immediately. Since fish stock is sometimes hard to find, (and is a big P. I. T. A. to make), you can easily substitute half clam juice and half vegetable stock, both of which are readily available at your local supermarket. I used cod, but you can also use any non-oily fleshy fish. You could also use several different kinds of fish. Some people prefer to add some variety of smoked fish for extra savory flavor, such as smoked haddock. Adding shrimp or other seafood is also very common. There's really no right or wrong. It's whatever you like and whatever is fresh and available! You can load it up with any kind of veggies too, if you like. Spinach, peas, carrots, really anything would work. Spinach and peas would cook right in the casserole, but I'd just suggest briefly blanching carrots or broccoli first before adding them to make sure they're fully cooked by the time you take it out of the oven. Another option would be to serve the veggies on the side.